Back in November, she picked up representation by one of the world's premiere artist management companies, and now Jocelyn Lee has something else to be proud of: the release of her new book, Nowhere But Here. 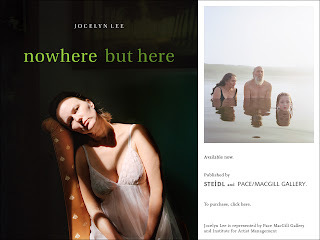 The book is a culmination of 10 years worth of work for Lee, and as her publisher writes, "Jocelyn Lee encourages us to think about eternal issues such as youth and age, our connections with one another, our relationship with nature, and the place – or places – we call home." Pick yourself up a copy.